Minnesota Twins pitcher Phil Hughes looked good in his bullpen session Friday and will start against the Detroit Tigers on Tuesday after spending the last month on the disabled list with a back injury. The Twins considered sending Hughes to the Kernels for a rehab assignment, but that will not happen. Hughes, 29, has been on the 15-day Disabled List since Aug. 13 with a lower back strain. Minnesota Twins pitcher Phil Hughes could make a rehab assignment with the Cedar Rapids Kernels and pitch for them in the Midwest League playoffs against Peoria, according to a report in the Pioneer-Press newspaper in Minnesota. Hughes, 29, has been on the 15-day Disabled List since Aug. 13 with a lower back strain. His final step before re-joining the Twins could come in an outing with the Kernels on Sunday or Monday against Peoria at Veterans Memorial Stadium. The Kernels begin the best-of-3 series at Peoria Saturday night. Monday's game would be "if necessary" if the series is tied, 1-1, at that point. Hughes is a 6-foot-5 right-hander. He has an 82-68 record in nine years in the Major Leagues with the Yankees and Twins, including a 10-8 mark and 4.49 ERA this season. His salary for this year is $9.2 million. DAVENPORT - It’s a cliché, but sometimes it really is the little things that win ballgames at playoff time. That was the case again Thursday night as the Cedar Rapids Kernels and Quad Cities River Bandits could not finish their game in regulation, needing 11 innings before the Kernels finally topped the Bandits, 3-1, before a crowd of 1,555 at Modern Woodman Park. Chris Paul delivered a two-run single in the 11th inning for the Kernels and finished the game with three hits and all three of his team's RBIs. With the win, the Kernels claimed the first-round playoff series two games to none and advance to face Peoria in the Midwest League’s Western Division Championship series. The Kernels will open the best-of-3 series at 6 p.m. Saturday at Peoria, The second game will be played at at 4:05 p.m. Sunday at Veterans Memorial Stadium in Cedar Rapids, with Game 3 (if necessary) at 6:35 p.m. Monday in Cedar Rapids. There are few sure things in life except death and taxes, but you can add Felix Jorge to the list as well. He pitches deep into every game he throws. During the regular season, Jorge made 22 starts for the Cedar Rapids Kernels and lasted at least six innings 20 times and at least five innings in the other two outings. That reliability earned him the start for Cedar Rapids in Game 1 of its playoff series with the Quad Cities River Bandits Wednesday night and Jorge once again went deep for the Kernels. Jorge threw 7 1/3 innings and allowed just two runs on nine hits in a 5-2 victory before 1,552 fans at Veterans Memorial Stadium. Jorge was in command all night, able to work out of a few minor threats in the early innings. He struck out seven batters and walked one. Kernels Manager Jake Mauer agreed. It's taken 15 years as a player, coach and manager in the minor leagues with the Minnesota Twins organization, but Jake Mauer has finally gotten the call to experience life in the big leagues. The Cedar Rapids Kernels manager will join the Twins as a coach for the last few weeks of the American League season after the Kernels are done in the Midwest League playoffs. Mauer, 36, has spent his entire pro baseball career with the Twins and reached the Double-A level before an arm injury ended his playing days after the 2005 campaign. Mauer grew up a Twins fan in the Twin Cities and his brother, Joe, has enjoyed an all-star career with the club and is their starting first baseman. Now Jake Mauer will be joining his younger brother in the Major Leagues and getting a first-hand look at Target Field from the ground level. Cedar Rapids Kernels Manager Jake Mauer had one of those "Oh, no!" looks in the sixth inning Monday after Brian Navarreto got hit by a pitch on his left hand and was sitting in the dirt by home plate in pain. The Midwest League playoffs begin Wednesday night and for awhile Mauer thought he might be without the services of his best catcher when the Kernels host the Quad Cities River Bandits in Game 1. Navarreto is not in the clear yet, but X-rays were negative and the 21-year-old catcher from Puerto Rico does not have any fractures in his hand. "It's kind of painful right now, but I don't have anything broken," he remarked. Navarreto said he plans to play Wednesday night. 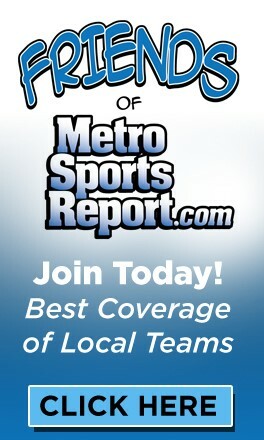 The Kernels lost to Clinton, 6-2, Monday in the final game of the regular season at Veterans Memorial Stadium. It was a meaningless game in terms of the standings, although Clinton managed to avoid setting a franchise record for losses by winning the contest. The biggest news of the day was Navarreto, who is only a .217 hitter but a superior force behind the plate. Mauer was relieved when Kernels trainer Curtis Simondet told him there were no broken bones. Jake Mauer has a young family waiting for him in Minnesota, but the Midwest League playoffs start Wednesday and the Kernels skipper hopes to stay with his baseball "family" in Cedar Rapids for as long as possible and take a shot at the title. "To me it's whether I get home in a week or two weeks or three weeks. It doesn't really matter," said Mauer, who has been in Cedar Rapids since early April. The Kernels clipped Clinton, 3-1, Sunday before 3,065 fans at Veterans Memorial Stadium for their third straight victory to gain a little momentum for the playoffs. The Kernels will host Clinton in the final game of the regular season Monday at noon, then they'll host Quad Cities in the first game of the best-of-3 playoffs Wednesday night. Cedar Rapids struggled in August with a 12-16 record for the month, including a four-game losing streak from Aug. 14-18 and a five-game skid from Aug. 25-29, but Mauer thinks his club has found its legs again heading into the postseason tournament. "That's what you hope, that you start playing better," he said. "We weren't too good two weeks ago. We had a tough stretch. For 10 in a row, we were bad. A crowd of 2,509 showed up for the final night of post-game fireworks for the Cedar Rapids Kernels at Veterans Memorial Stadium Saturday and saw the home team top the Clinton LumberKings, 9-3, in the opener of the final series for both teams. The real fireworks for the Kernels, however, begin on Wednesday night when they host the Quad Cities River Bandits in the first game of the Midwest League playoffs. The River Bandits and Kernels have known they were playoff bound since they finished first and second, respectively, in the first half of the MWL season in June. That has allowed Kernels Manager Jake Mauer and his coaching staff to spend the final week of the season preparing for their postseason series with Quad Cities. Mauer named his starting pitching rotation Saturday. 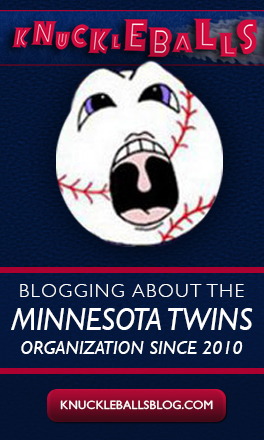 “(Felix) Jorge will go game 1 and then Gibby (Sam Gibbons) will go game 2,” Mauer revealed. If a third game is necessary on Friday, Mauer said Saturday night’s winning pitcher Keaton Steele (7-4) will get the call. 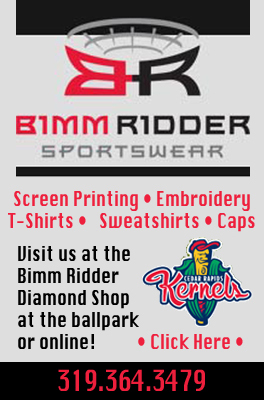 GRAND CHUTE, Wis. - The Cedar Rapids Kernels edged the Wisconsin Timber Rattlers, 5-4, Friday night in the rubber game of their series before 4,727 fans at Fox Cities Stadium. The Kernels had lost four straight series to Midwest League opponents before winning the series against Wisconsin. Cedar Rapids returns home Saturday night to host the Clinton LumberKings at 6:35 p.m. in the final series of the regular season. The Kernels (75-62) scored three runs in the fourth inning for a 3-0 lead. Alex Real and Brett Doe had RBI singles in the frame. GRAND CHUTE, Wis. - The Cedar Rapids Kernels were held to five hits Thursday night and fell to the Wisconsin Timber Rattlers, 4-0, before 4,435 fans at Fox Cities Stadium. It was the Kernels' first road loss at Wisconsin this season in 11 games. The Kernels are now 15-2 against the Timber Rattlers in 2015. Cedar Rapids stranded 10 men on base. Nick Gordon and Brett Doe had two hits. Gordon and Chris Paul had doubles and were hit by a pitch. Wisconsin jumped to a 3-0 lead in the third inning. The Timber Rattlers quickly loaded the bases as Mitch Meyer walked, Luis Aviles doubled and Sthervin Matos drew a base on balls to begin frame. With the bases loaded and nobody out, Blake Allemand's sacrifice fly to right scored Meyer for the game's first run. The throw home allowed both Aviles and Matos to move into scoring position. Aviles came home on Elvis Rubio's RBI groundout, making the score 2-0. David Denson's RBI single to left brought Matos home and pushed the Wisconsin lead to three runs.